FINISHED! Poetry Reading on Easter Sunday, April 16 at 11:30 a.m.
What a delight it was to have the birthday girl read for us! 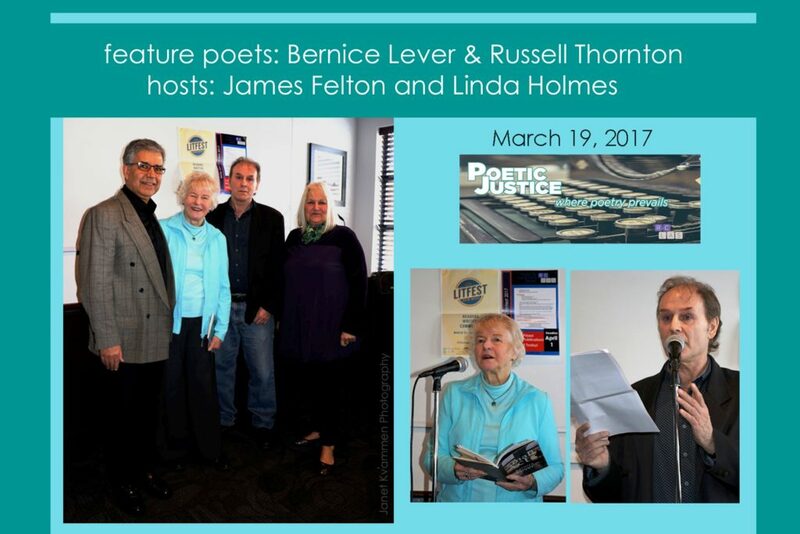 Bernice Lever turned 81 the day of her poetry reading at Poetic Justice. She shared some of the entries from her most recent poetry collection, Small Acts. And she was joined by the much-revered Russell Thornton who delivered some scintillating poems from his upcoming manuscript, The Terrible Appearances, as well as a requested favourite, “Lemon Groves”. We also discovered that at age 19, Russell Thornton sent one of his first-ever poems to the founder and editor of Waves magazine, none other than Bernice Lever! April’s poetry reading is on Easter Sunday and it’s going to be a blast. Maybe the Easter Bunny will be there as well. Here’s why. Both our featured poets are from out of town but neither is a stranger to the Vancouver writing scene. Penn Kemp is London, Ontario’s first Poet Laureate and Sharon Thesen lives in the Okanagan. And here’s more about both of them. 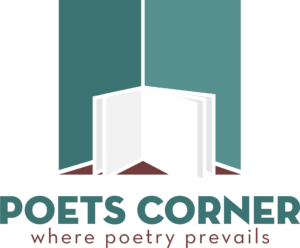 Penn Kemp, M.Ed., is delighted to return to Poetic Justice! Activist poet, performer and playwright, Penn is a League of Canadian Poets Life Member and winner of their 2015 Spoken Word Artist of the Year award. She is the inaugural Poet Laureate for London, Ontario. As Writer-in-Residence for Western University, her project was the DVD, Luminous Entrance. Her new plays are available on the Playwrights Guild of Canada website. Other recent works are Barbaric Cultural Practice (Quattro, 2016) and two anthologies, Women and Multimedia and Performing Women as well as Dream Sequins, Lyrical Myrical Press, and Jack Layton: Art in Action, which she edited for Quattro Books, Toronto. Her first poetry collection, Bearing Down (Coach House Press), appeared in 1972. She also edited the first collection of women’s poetry in Canada when she guest-edited Issue No. 14 of Is magazine in 1973. Since then, Penn has published thirty books and has had six of her plays produced. Sharon Thesen lives in the Okanagan’s Lake Country, and is Professor Emeritus of Creative Writing at UBC’s Okanagan campus. 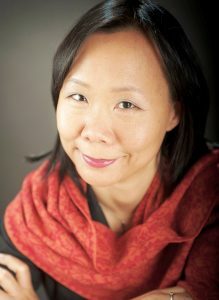 She is a BC-based poet, editor, critic, and teacher who has published nine books of poetry, most recently The Good Bacteria (2009) and Oyama Pink Shale (2011) both with House of Anansi Press. 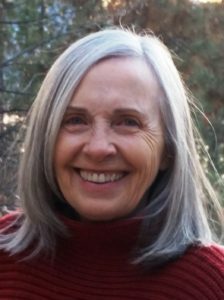 She has also edited two editions of The New Long Poem Anthology and was an editor at The CapilanoReview and co-editor of Lake: A Journal of Arts and Environment. A winner of the Pat Lowther Award, she has also been a three-time finalist for the Governor-General’s Award and a frequent finalist for the Dorothy Livesay Award. In 2002, she was a jury member of the prestigious Griffin Poetry Prize. 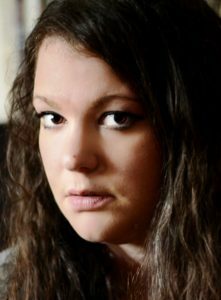 She currently writes journalistic essays for the online magazine Dispatches, and continues to teach poetry workshops and facilitate readings and events in Kelowna. Her current poetry manuscript is titled Eternal City of the West. So join us and hear from two writers who have not been carving but excavating literary history in Canada. Their reputations have already made it to the top-most bookshelf. It’s likely this will be a poetry reading you’ll remember for a while. So mark your calendars for Sunday April 16. Remember we get underway at 11:30am. Come early so you can register for open mic and place your food & beverage order. See you for brunch with items starting at $10! Posted in Uncategorized	| Comments Off on FINISHED! Poetry Reading on Easter Sunday, April 16 at 11:30 a.m. FINISHED! Next PJ Reading is Sun March 19 at 11:30 a.m. The honour roll doesn’t get any bigger than this. When you have two featured poets who have each received the Order of Canada (within four months of each other! ), it doesn’t get any more distinguished than that. 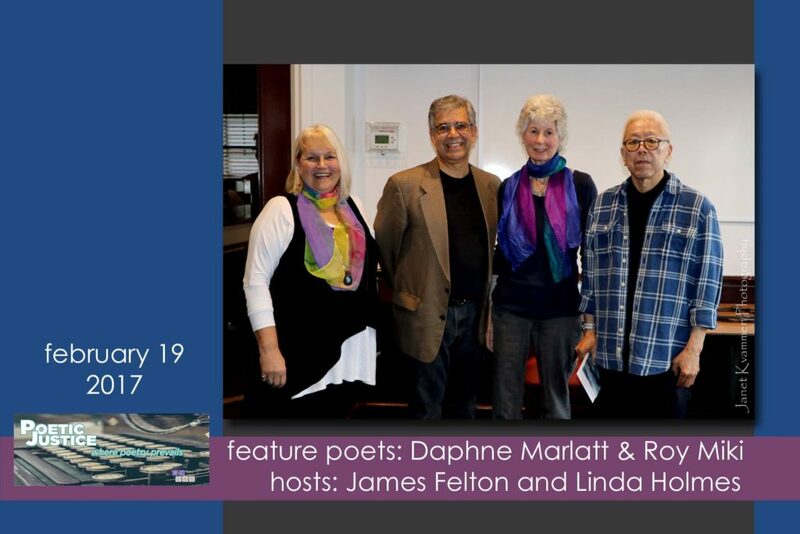 On Sun Feb 19, good friends Daphne Marlatt and Roy Miki read together for the first time since the 70s. Poetic Justice was thrilled to reunite two of the west coast’s most influential writers through our reading series. Bernice Lever is the founder of Waves, a seminal literary magazine that ran from 1972 to 1987. Her latest book, Small Acts, is her 16th publication and 11th poetry collection. 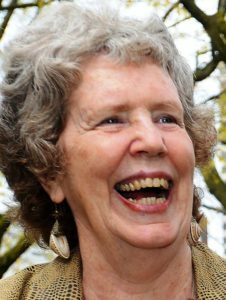 She has been actively involved in the Canadian Authors Association, the League of Canadian Poets, the Federation of BC Writers, and local writers’ groups. 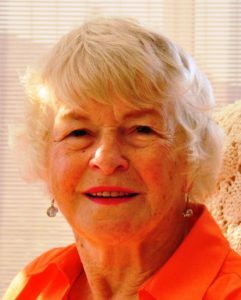 Bernice has read her poems on five continents and has amassed four Lifetime Achievement awards, including the CAA’s Sangster Award. 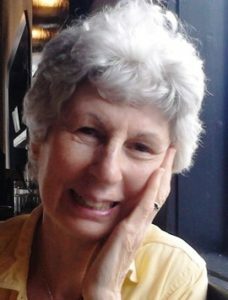 She continues to edit manuscripts for others which she began in the 1980s at Dundurn Press, Toronto. 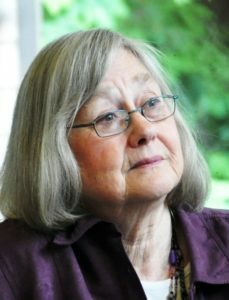 Retired from Toronto’s Seneca College Department of English, she still presents writing workshops, if she is not writing poetry or watching the deer stroll by her home on Bowen Island. Russell Thornton’s The Hundred Lives was shortlisted for the 2015 Griffin Poetry Prize. His Birds, Metals, Stones & Rain was shortlisted for the 2013 Governor General’s Award for Poetry, the Raymond Souster Award and the Dorothy Livesay BC Book Prize. His other titles include The Human Shore, House Built of Rain, A Tunisian Notebook, and The Fifth Window. He is the co-translator of Poems from the Scythian Wild Field: A Selection of the Poetry of Dmytro Kremin (Ekstasis, 2016). He has a new collection, The Terrible Appearances, forthcoming in 2018. He lives in North Vancouver, BC. So mark your calendars for Sunday March 19. We are underway at 11:30am. Come early so you can register for open mic and place your food & beverage order. Come and enjoy brunch with the poets, with tasty fare starting at $10! Posted in Uncategorized	| Comments Off on FINISHED! Next PJ Reading is Sun March 19 at 11:30 a.m. FINISHED! Next PJ Reading is Sun Feb 19 at 11:30 a.m.
January’s reading was nothing short of superb. Cerebral poems were topped with emotionally charged ones, like poached eggs smothered with hollandaise sauce (okay, hunger is talking here). A fresh voice joined a seasoned one as Chelsea Comeau teamed up with E.D. Blodgett and gave a full house something special. Daphne Marlatt is a critically acclaimed poet (Steveston, Liquidities) and novelist (Ana Historic, Taken). Her most recent title, Reading Sveva features a series of poems in response to the life and work of the Italian-Canadian painter, Sveva Caetani. Roy Miki grew up in Winnipeg and moved to Vancouver in the late 1960s. 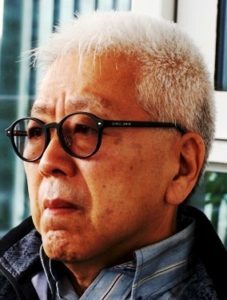 He is the author of many books, including Redress: Inside the Japanese Canadian Call for Justice (Raincoast 2004), as well as five books of poems. His third book of poems, Surrender (Mercury Press 2001), received the Governor General’s Award for Poetry. More recent publications are Mannequin Rising (New Star 2011), a series of poems and photo collages that probe the internal effects of commodity culture; In Flux: Transnational Shifts in Asian Canadian Writing (NeWest 2011), an essay collection; and Dolphin SOS (Tradewind Books 2014), a children’s book co-written with his wife Slavia, and illustrated by Julie Flett. 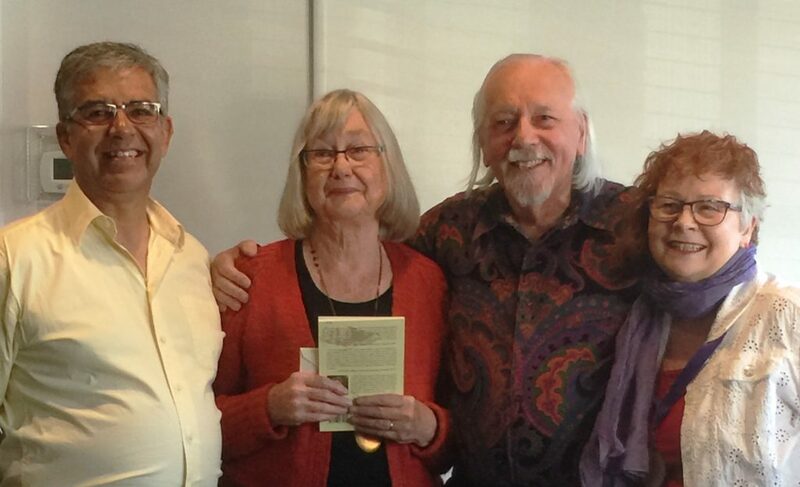 Dolphin SOS received a 2014 BC Book Prize for best illustrated children’s book. So mark your calendars for Sunday February 19 and please don’t forget we get underway at 11:30am. Come early so you can register for open mic and place your food & beverage order. So see you for brunch with items starting at $10! Posted in Uncategorized	| Comments Off on FINISHED! Next PJ Reading is Sun Feb 19 at 11:30 a.m. FINISHED! Next PJ Reading is Sun Jan 15 at 11:30 a.m.
Forgive us but we’ve had a glitch with posts to the website. All’s good again — for now. Last month we were thrilled to have two powerful voices sharing the podium. Kate Braid, a previous visitor to PJ, was joined by new-to-PJ poet, Richard Therrien. For some reason, the readings seemed rushed this time, but not before we were dazzled by these two stellar poets. It’s worth repeating, even if you know, we’re taking a break over the Christmas holidays. There is no reading in December, but we’ll be firing up the engines again in January. E.D. (Ted) Blodgett, FRSC, is Distinguished University Professor Emeritus at the University of Alberta where he taught about 40 years, and held the Louis Desrochers Chair in Études Canadiennes, Campus Saint-Jean (2008-10). His publications in mediaeval studies include two translations, notably, The Love Songs of the Carmina Burana with Roy Arthur Swanson (Garland Publishing, 1987), and The Romance of Flamenca (Garland Publishing, 1995). He has written books on D.G. Jones and Alice Munro, and more recently, Five-Part Invention: A History of Literary History in Canada (University of Toronto Press, 2003) and Les Enfants des Jésuites ou le sacrifice des vierges (Les Presses de l’Université Laval, 2013). 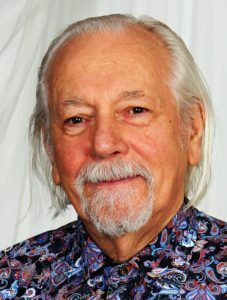 He has published 27 books of poetry, of which two have received the Governor General’s Award. His most recent book is Horizons, the third of his books in both English and French. He is a past poet laureate of Edmonton (2007-09), and a former Writer-in-Residence at Grant MacEwan University (2004). He is currently involved in writing another bilingual renga. Chelsea Comeau is a freelance writer and editor whose work has appeared in the Claremont Review, Quills, and CV2. In 2015, she was the Canadian winner of the Leaf Press chapbook contest, and attends poetry retreats with Patrick Lane and Lorna Crozier. She is currently the poetry editor of WordWorks magazine. So mark your calendars for Sunday January 15 and please don’t forget the earlier start time of 11:30am. Come early so you can register for open mic and place your food & beverage order before we get underway. So see you for brunch with items starting at $10! Posted in Uncategorized	| Comments Off on FINISHED! Next PJ Reading is Sun Jan 15 at 11:30 a.m. FINISHED! Next PJ Reading is Sun Nov 20 at 11:30 a.m.
Our last reading was special. The rain stopped and the poets came out to play. And so did the poetry fans. Susan McCaslin dazzled us with her ekphrastic poetry inspired by the works of Cézanne while Richard Osler rattled our emotional cupboards with his poems of unfiltered vulnerability. Kate Braid has written, co-written and edited eleven books of non-fiction and prize-winning poetry. 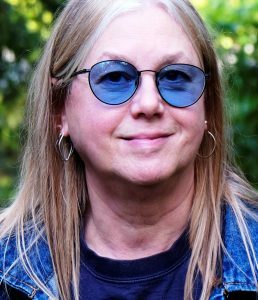 Her latest books are a memoir, Journeywoman: Swinging a Hammer in a Man’s World about her 15 years in construction, and a book of poems, Rough Ground Revisited. In 1995, with Sandy Shreve she edited the ground-breaking book, In Fine Form: The Canadian Book of Form Poems; its expanded second edition is now out. In 2015 she was awarded the Mayor of Vancouver’s Award for the Literary Arts for showing leadership and support for Vancouver’s cultural community. Check out her website. Richard Therrien is an editor and writer living in North Vancouver. He has published poetry and prose in various periodicals, including Grain, The New Quarterly, Prairie Fire, Filling Station, Absinthe, and CV2. His chapbook Water Language Faith was published by Alfred Gustav Press (2012). He is co-author, with Dean Neu, of Accounting for Genocide, Canada’s Bureaucratic Assault on Aboriginal People (Fernwood Publishing/Zed Books, 2003). His poetry collection Sleeping in Tall Grass from the University of Alberta Press (Robert Kroetsch Series) launched in the Spring of 2016. So mark your calendars for Sunday November 20 and please don’t forget the earlier start time of 11:30am. Come early so can register for open mic and place your food & beverage order before we get underway. So see you for brunch! Posted in Uncategorized	| Comments Off on FINISHED! Next PJ Reading is Sun Nov 20 at 11:30 a.m. Simply put, this month’s reading was over-the-top. Having Eileen Kernaghan back with us after a long absence was so gratifying. And Henry Beissel’s reading had everyone captivated. It’s so rewarding having talented poets descend on Poetic Justice. It makes it so worthwhile bringing the likes of writers of such a high calibre to our series. In October, the tradition continues. At PJ we bring you an incredibly diverse line-up of poets where there is always one certainty: deep, uncompromising talent. 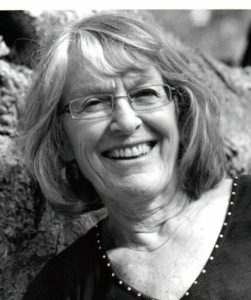 Susan McCaslin has published thirteen volumes of poetry. Her upcoming one is Painter, Poet, Mountain: After Cézanne (Quattro Books, Sept. 2016). Previous volumes include The Disarmed Heart (The St. Thomas Poetry Series, 2014) and Demeter Goes Skydiving (University of Alberta Press, 2011). The latter was short-listed for the BC Book Prize (Dorothy Livesay Award) and the first-place winner of the Alberta Book Publishing Award (Robert Kroetsch Poetry Book Award) in 2012. Susan has also published a memoir, Into the Mystic: My Years with Olga (Inanna Publications, 2014). She currently lives in Fort Langley, British Columbia where she initiated the Han Shan Poetry Project as part of a successful campaign to protect an endangered rainforest along the Fraser River. 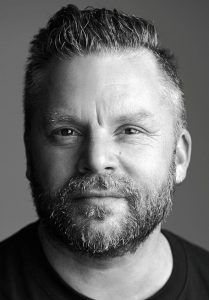 Richard Osler was born in Toronto and now lives in Duncan on Vancouver Island, where he facilitates poetry writing retreats and, also, weekly poetry workshops at The Cedars, an addiction recovery centre. His chapbook of short poems Where the Water Lives was published by Leaf Press in 2012. His poems have appeared in many journals. In 2011 he was a finalist for the Malahat Open Season Awards in poetry and in 2015 he was long-listed for the PRISM International Poetry Prize. 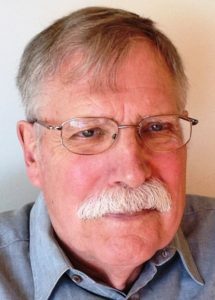 His other writing includes chapters in The Rock Rabbit and the Rainbow: Laurens van der Post Among Friends and The Latest Morningside Papers by Peter Gzowski. So mark your calendars for Sunday October 16 and please don’t forget the earlier start time of 11:30am. Come early so can register for open mic and place your food & beverage order before we get underway. So see you for brunch! FINISHED! Next Poetic Justice Reading is Sun Sep 18 at 3:00 p.m. If you weren’t there you missed something special. With a nearly full house last Sunday, two seasoned and stellar poets kept us glued to the mic. Heidi Greco and Christopher Levenson, what a professional, playful, and profound duo! Open mic readers were particularly peerless, too. We’ve said to those open mic’ers who didn’t have the chance to read, they’ll be first up at next month’s reading. Henry Beissel is a poet, playwright, essayist, translator and editor who lives in Ottawa. 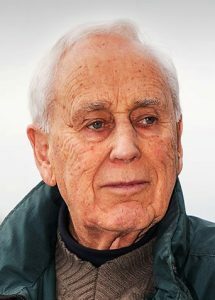 His commitment to writing first came to national attention through the controversial political and literary journal Edge which he founded in Edmonton and edited from 1963 to 1969. Since then he has over thirty publications to his credit that have received high critical acclaim in Canada and abroad. His versatility as a writer is evident even in a partial list of them: twenty volumes of poetry; six books of plays, both for adults and young audiences; numerous productions of his plays as well as of his adaptations of plays (most recently Ibsen’s Peer Gynt, 2009, and Sophocles’ Antigone, 2011, both performed to much critical and audience acclaim); translations from the works of Bauer, Huchel, Ibsen, Mrozek, and Dorst; fiction and non-fiction; a book on Canada; a Festschrift for Irving Layton; two anthologies of plays for High Schools. His work has been translated into more than a dozen languages. 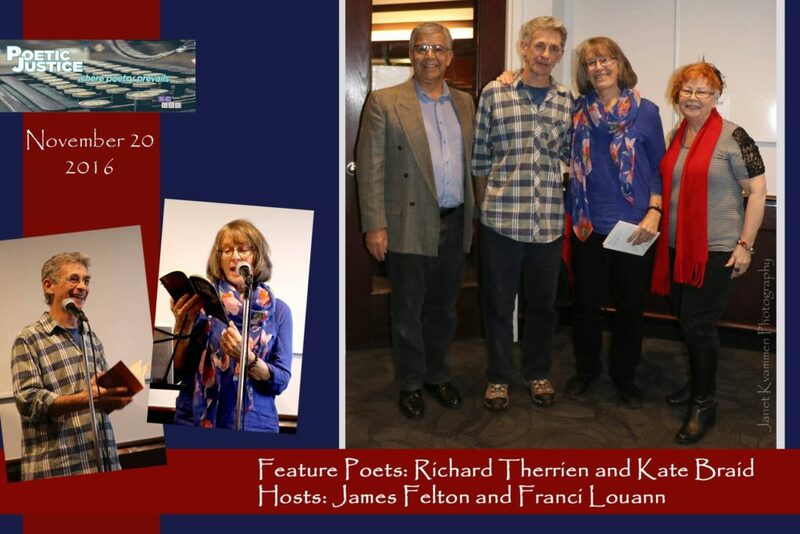 Eileen Kernaghan’s poetry has appeared in PRISM international, The Antigonish Review, Room of One’s Own, Acta Victoriana, Wascana Review, The Magazine of Speculative Poetry, the anthology Quintet: Themes & Variations (Ekstasis Editions ) and other publications both mainstream and speculative. Her collection Tales from the Holograph Woods was published in 2009 by Wattle & Daub Books. Eileen has also published nine historical fantasy novels. In 2014 Sophie, in Shadow was shortlisted for the Sunburst Award for Canadian Literature of the Fantastic, and for the Sheila Egoff Prize for Children’s Literature. She lives in New Westminster. So mark your calendars for 3:00 p.m. on Sunday September 18, and in the meantime consider something you’d like to present at our Open Mic that day. Arrive on time in order to make the list before the cut-off. Also, don’t forget the last reading at Poetry in the Park goes on Wednesday, August 31 at 6:00 p.m. Don’t miss the finale reading of PiP’s summer series. Check out the line-up here. Posted in Uncategorized	| Comments Off on FINISHED! Next Poetic Justice Reading is Sun Sep 18 at 3:00 p.m. FINISHED! Next Poetic Justice Reading is Sun Aug 21 at 3:00 p.m.
Life isn’t always good — or just. Then sometimes, it is. A week ago our featured poets, John Barton and Tina Biello, both shared about the dichotomies of life. From the unforgivable behaviour by the British government towards Alan Turing, to the warmth and preciousness of familia, both Island poets held us captive with a couple of wonderfully superb readings. Poetry is a good thing. 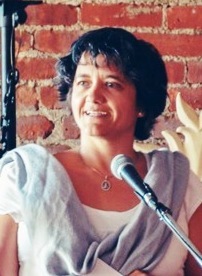 Heidi Greco is a writer, editor, and sometimes-instructor. She and her partner live in a house in Surrey that might as well be nestled in a forest; it’s completely surrounded by trees. She’s a longtime recycler, composter and forager and can be found picking berries or mushrooms, depending on the season. Her poetry, fiction, essays and reviews have been published in a vast array of books, anthologies and literary magazines. In 2015, she had poems that appeared in four anthologies, including The Revolving City: 51 Poems and the Stories Behind Them. She has a new book forthcoming in 2018. 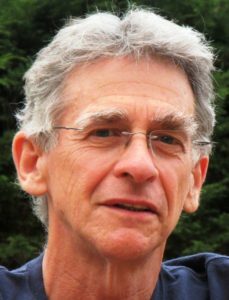 Christopher Levenson settled in Vancouver in 2007 after 39 years in Ottawa, where he taught English and Creative Writing at Carleton University. His eleven books of poetry include most recently Night Vision (Quattro Books, 2014), which was short-listed for the Governor General’s Award. First recipient in 1960 of Britain’s Eric Gregory Award, he also won Ottawa’s Archibald Lampman Award in 1987 for Arriving at Night, co-founded and was first editor of Arc magazine, and, with Rob Taylor, revived the Dead Poets Reading Series at the VPL. He translates German and Dutch poetry and is enthusiastic about South Asian Literature in English. So mark your calendars for 3:00 p.m. on Sunday August 21, and in the meantime consider something you’d like to present at our Open Mic that day. And here’s a shout-out to Poetry in the Park… this Wednesday at 6:00 p.m. It’s going to be good weather all week, so take it in. Check out their line-up here. Posted in Uncategorized	| Comments Off on FINISHED! Next Poetic Justice Reading is Sun Aug 21 at 3:00 p.m. FINISHED! Next Poetic Justice Reading is Sun July 17 at 3:00 p.m. It was a barn-burner of beautiful poetry at June’s monthly reading. Not only did we have three very diverse but equally talented poets, but Fiona Lam, Jeff Steudel, and Alan Woodland were all superb at delivering their work in a professional and captivating manner. We even had a viewing of our first video poem at Poetic Justice! In July, it’s going to be an all-Island affair when John Barton from Victoria and Tina Biello from Nanaimo join us. Once again, it will be a Poetic Justice debut performance for these two gifted poets. 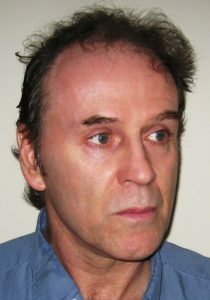 John Barton has published eleven books and six chapbooks of poetry, including West of Darkness: Emily Carr, a Self-Portrait (third bilingual edition, BushcekBooks, 2006), Hypothesis (Anansi, 2001), Hymn (Brick, 2009), For the Boy with the Eyes of the Virgin: Selected Poems (Nightwood, 2012), Balletomane: The Program Notes of Lincoln Kirstein (JackPine, 2012), Polari (Goose Lane, 2014), and Reframing Paul Cadmus (above/ground, 2016). Co-editor of Seminal: The Anthology of Canada’s Gay-Male Poets (Arsenal Pulp, 2007), he is editing The Essential Douglas LePan for Porcupine’s Quill. Born and raised in Alberta, he lives in Victoria, where he edits The Malahat Review. Tina Biello grew up in the small logging town of Lake Cowichan, BC. She studied Theatre at UBC and now finds herself writing. Since 2008 her poems have appeared in chapbook anthologies edited by Patrick Lane. Her first book of poetry, In the Bone Cracks of the Walls (published by Leaf Press) was part of a multi-disciplinary art exhibition of poetry, watercolour and music in Montreal, Vancouver, and Italy. A Housecoat Remains is her second book of poetry published by Guernica Editions in 2015. She also teaches performance mask to students all over Vancouver Island. So mark your calendars for 3:00 p.m. on Sunday July 17, and in the meantime consider something you’d like to present at our Open Mic that day. 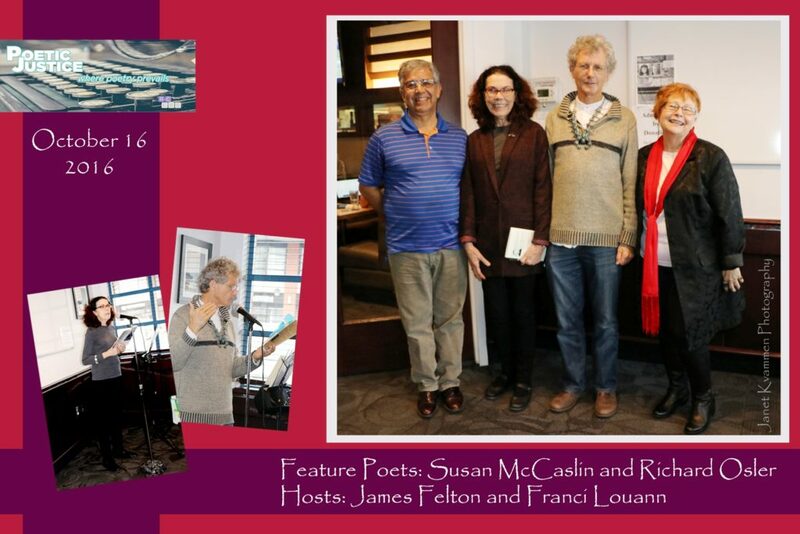 And here’s a shout-out to Poetry in the Park which kicks off its 2016 summer schedule on Wednesday, July 06. Check out their line-up here. Posted in Uncategorized	| Comments Off on FINISHED! Next Poetic Justice Reading is Sun July 17 at 3:00 p.m. FINISHED! 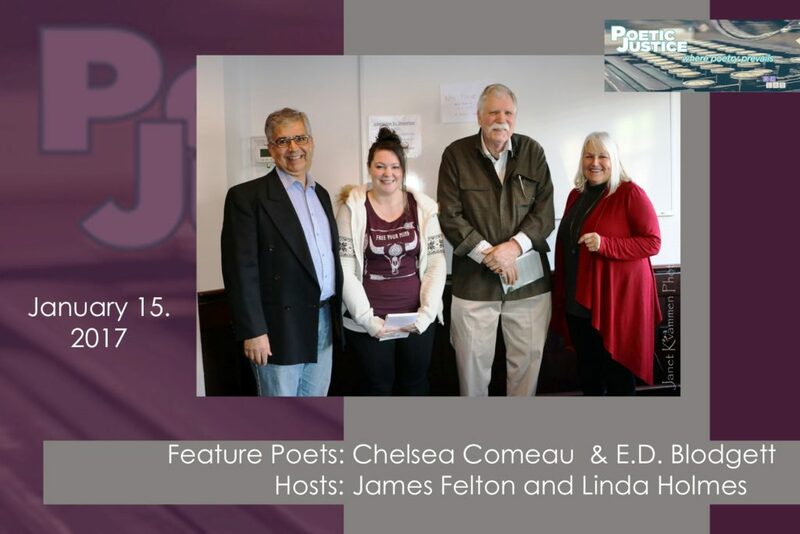 Next Poetic Justice Reading is Sun June 19 at 3:00 p.m.
What a superb afternoon of poetry we had during LitFest Week! It was like a summer solstice where the readings, including those from our open mic’ers, reached their zenith. Fiona Tinwei Lam has authored two poetry books, Intimate Distances and Enter the Chrysanthemum and the illustrated children’s book, The Rainbow Rocket. Her poetry and prose appear in over 24 anthologies, including The Best Canadian Poetry in English 2010 and Slice Me Some Truth: An Anthology of Canadian Non-Fiction. She co-edited the non-fiction anthology, Double Lives: Writing and Motherhood, and edited The Bright Well: Contemporary Canadian Poetry about Facing Cancer. Her poems have twice been chosen for B.C.’s Poetry in Transit program. Her video poems have been screened locally and internationally. She is currently a writing mentor and instructor at SFU Continuing Studies. Jeff Steudel’s poetry has appeared in several publications including Prism international, CV2, The Fiddlehead, sub Terrain, and Canadian Literature. He has received the Ralph Gustafson Poetry Prize, and his work was chosen as a finalist for the CBC Literary Awards. 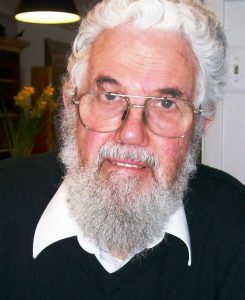 Foreign Park, his first collection of poetry, was a finalist for the B.C. Book Prizes. Jeff lives in Vancouver. 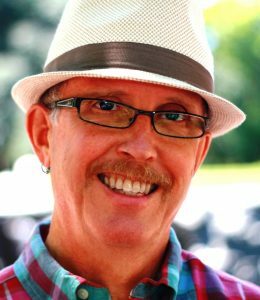 Alan Woodland is a writer, poet, performer, and newspaper columnist. He has written three books, and his poetry has been featured on radio and television. For many years, he was Chief Librarian for the New Westminster Public Library. In 1993, harpist Lori Pappajohn and Alan co-founded Winter Harp, a concert ensemble of harps, flutes, rare medieval instruments, poetry and song celebrating the Christmas season. Alan has lived in Maple Ridge, British Columbia since 1957. He first met his wife, Pat, almost seventy years ago, and they have been married for close to sixty. They have four children and four grandchildren. See you all on Sunday, June 19 at three o’clock. Lately, we’ve been packing out the joint, so get there on time, especially if you want to make it to the Open Mic list. Posted in Uncategorized	| Comments Off on FINISHED! Next Poetic Justice Reading is Sun June 19 at 3:00 p.m.